1. Planting and Nourishing: The first step to making your morning cup of Joe is planting. Coffee may just be a drink to many, but its important to know that it comes from a seed that grows into a berry. All coffee is grown in something called the “bean belt,” which refers to the area between the Tropics of Cancer and Capricorn. It is in this area where the conditions to grow and harvest coffee come together perfectly. Coffee seeds require a lot of water are generally planted in shaded areas during the wet season. 2. Harvesting: When the coffee berries turn a bright red, they are ripe, and farming families work long hours to pick the berries. Picking the coffee berries is a labor-intensive work that requires patience, especially because not all the berries ripen at once. Pickers can pick up 200 pounds of coffee a day, which would yield up to 40 pounds of coffee beans. 3. Processing: To prevent the coffee from spoiling, the processing stage must begin as soon as possible after the berries are picked. The first step of processing is to de-pulp the coffee berries, which helps to maintain the quality. Then the coffee sits in fermentation tanks for up to 24 hours. This process allows the coffee to fully develop before the washing process. 4. Sorting and Drying: High quality coffees are hand sorted, which requires a great deal of skill. Beans are initially sorted by size and weight, and are then evaluated for imperfections such as color flaws. Following the sorting process, beans are dried by either mechanical dryers or by the sun. 5. Milling or De-husking: Milling the beans is the process of removing the remaining layers of fruit from the coffee to reveal the bean. A machine gently tumbles the coffee berries before being prepared to export generally completes this process. 6. Export: After beans are milled, they are referred to as “green coffee” and ready to be exported to coffee drinking nations around the world. 8. Roasting: Coffee beans are roasted to bring out the most distinct and desirable flavors. 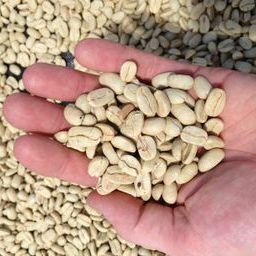 It is the roasting process that turns green coffee beans into the brown beans that we purchase. Beans are roasted at about 500 degrees F, and after a few minutes the beans will “pop” and double in size. A second “pop” means the bean is done roasting and ready to make its way to your mug. 9. Grinding: The grinding process is what prepares the coffee for the brewer. The coarseness of the grind often varies depending upon the brewing process. For example, coffee brewed in an espresso machine will be much finer than in a drip brew system. 10. Brew: There are a number of different brew methods that all yield different results in your cup. Examples could include pressurized brewing (espresso) or drip brew (coffee). 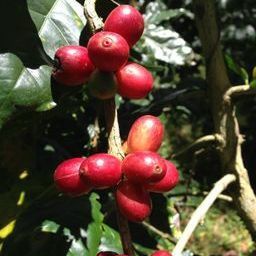 Above: Ripe red coffee berries fresh for the picking. 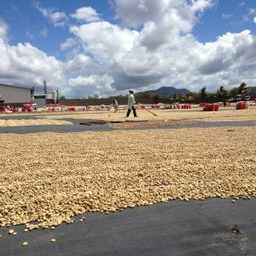 Above: Harvested and processed coffee drying in the sun prior to milling. Above: What’s known as “green coffee” ready for roasting!